Sky, the soft blue of a grasshopper's body. In the field—red fire like a cockscomb blossom, Still burning, contorting dry ashvattha leaves. But has paled like wan desires of a sickly shalik bird's heart. In the morning's light both sky and the surrounding dew-dampened forest sparkle like blue-green peacock wings. He'd been waiting for this dawn. Ripping, munching fragrant grass, green as young and tender grapefruit. Dazzle with his beauty, boldness, sheer desire doe after doe. The river's water scarlet like machka flower petals. Again the fire crackled—red venison served hot. Many an old dew-dampened yarn, while seated on a bed of grass beneath the stars. 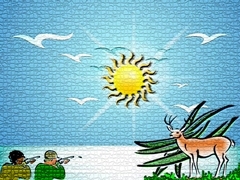 শিকার/"The Hunt," published in Kavita (কবিতা), September, 1936; included in the original Banalata Sen (বনলতা সেন). The ashvattha, sundari, and arjun are all trees; the shalik is a rather ordinary and ubiquitous bird in Bengal; machka is the name—but a local name that is not found in the standard dictionaries—of a red-petalled flowering plant.